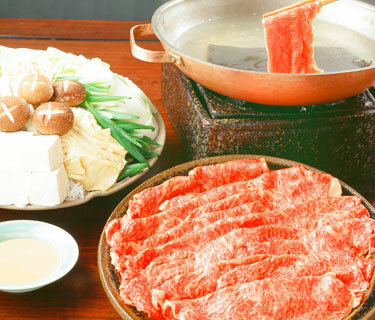 Shabu-shabu is a manner of eating extremely thin slices of meat blanched in boiling water. It originated from a Chinese dish wherein mutton is used. The quality of the ingredients is crucial for this quite simple dish. One can fully enjoy oneself with the luxurious taste of Matsusaka Ushi, which is referred as an “artwork of beef” with its fine marbling and delicate flavor. 1) Cut off the hard stems of the Chinese cabbage leaves and cut them roughly. 2) Cut the kujo-negi diagonally. Cut off the lower stem section of the enokidake mushrooms and divide them into small portions. Make an X-shaped cut at the top of the shiitake mushrooms. 4) Cut yuba, nama-fu and tofu into bite-sized pieces. 5) Mix mirin, soy sauce and citrus juice. 6) Place sesame paste in a bowl. Add the mixture prepared in (5) a little at a time and mix thoroughly each time in order to soften the paste. 7) Place kombu in water and boil. Lightly blanche the sliced beef until the color changes. Dip in sesame pon-zu prepared in (6) before eating. Matsusaka Ushi cattle are top-grade Japanese Black heifers. They are individually raised with the utmost care, including the feeding of beer, which is meant to enhance the cattle’s appetite. In addition to its beautiful marbling, its tender texture and sweet-flavored fat is also particular to Matsusaka Ushi. Yuba is a skin skimmed from the surface of boiled soy milk.